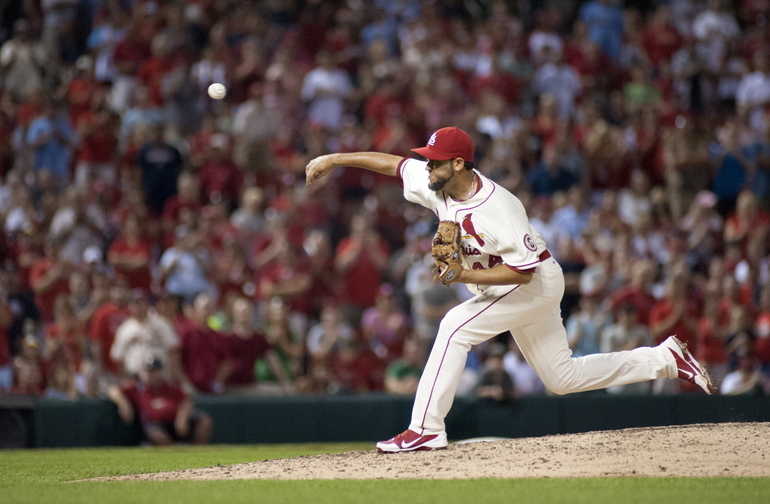 Edward Mujica, 29, is seen as insurance for 39-year-old reliever Koji Uehara. BOSTON — A person familiar with the deal said the Boston Red Sox and reliever Edward Mujica have agreed on a two-year contract. The move comes one day after Boston completed an $8.25 million, one-year contract with catcher A.J. Pierzynski. MARINERS: Utility player Willie Bloomquist officially signed a $5.8 million, two-year contract, bringing him back to the team where he started his major league career. The deal became official after Bloomquist, 36, passed a physical. He will earn $2.8 million in 2014 and $3 million in 2015. Bloomquist spent the past three seasons with the Arizona Diamondbacks, appearing in 225 games and hitting .289 with 36 doubles and 63 RBI over that time. RANGERS: Jose Contreras, the Cuban right-hander who turns 42 on Friday, signed a minor league contract with Texas that includes a non-roster invitation to major league spring training. Contreras spent last season with the Pittsburgh and Boston organizations. He has a 78-67 career record in the major leagues, with a 4.57 ERA. YANKEES: New catcher Brian McCann says joining the New York Yankees is “one of the best days of my life.” McCann was introduced at Yankee Stadium on Thursday, two days after completing an $85 million, five-year contract. He’s part of New York’s offseason spending spree that includes outfielder Jacoby Ellsbury, whose $153 million, seven-year deal is pending. McCann will wear No. 34. He was No. 16 with the Braves, but that number has been retired by the Yankees in honor of pitcher Whitey Ford. PHILLIES: Philadelphia signed catcher Wil Nieves to a $1,125,000, one-year contract. Nieves played in 71 games last season for the Arizona Diamondbacks and batted .297 with one home run and 22 RBI. He hit .302 with runners in scoring position. Over the last two years, he hit .299 in 103 games. DODGERS: Free-agent reliever Brian Wilson agreed to terms on a $10 million, one-year contract to stay with Los Angeles, a person with direct knowledge of the negotiations said. The deal is pending a physical, the person said, noting the team had not made an announcement regarding the quirky, bearded three-time All-Star. Wilson, the 2010 MLB saves leader while with San Francisco, went 2-1 with a 0.66 ERA in 18 outings over 132/3 innings this year for Los Angeles. TWINS: Minnesota finalized its $24 million, three-year contract with Phil Hughes after the pitcher passed his physical. Hughes, a right-hander, was 4-14 with a 5.19 ERA for the Yankees last season.